At work we are doing quite a bit with Debian. To make things easier and automated, we can use the non-interactive feature of the Debian packaging system to deploy services. One of the stacks we are enrolling is MySQL Group Replication, which requires at least 3 servers. Although the MySQL Documentation show how to install MySQL non-interactively, it is not entirely complete. The missing part is the extra question during the installation of the server whether you want to keep using the new default authentention method, or use the (now) legacy native method. If you are using a MySQL driver which has no support yet for strong password encryption (for example the go-sql-driver/mysql package driver), or you “need” to switch to MySQL 8.0 and keep previous user accounts intact, you will want to set the default back to the mysql_native_plugin for authentication. If you start new, and you can, stick to the new method. This post will show how to install MySQL 8.0 on a Debian 9 using the official MSQL APT repositories. 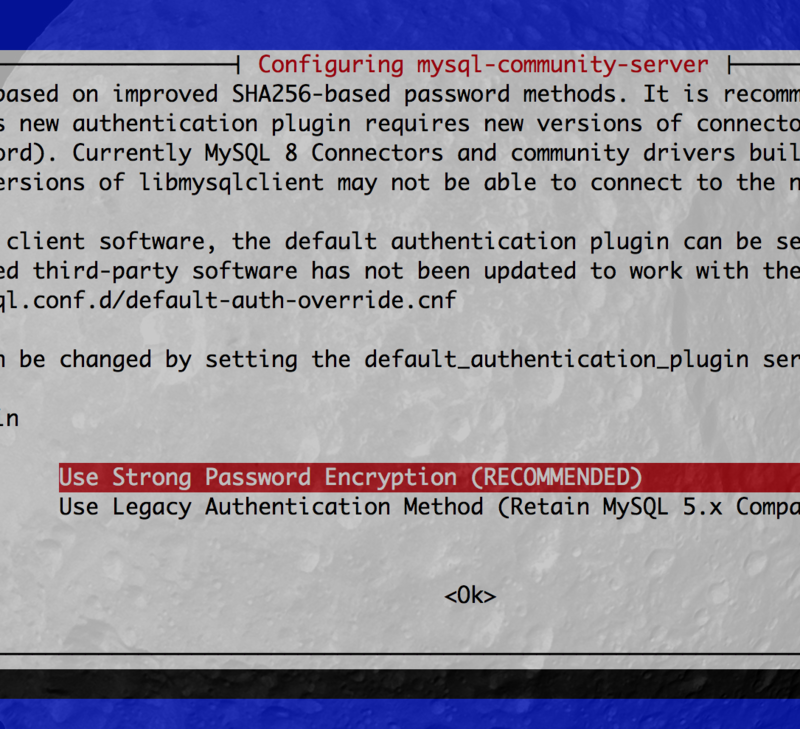 It also shows the extra step to keep using the legacy MySQL authentencation method. Debian comes with debconf which can be used to do install the whole distribtion non-interactively without a (virtual) monitor attached. You can also do such unattended installs for each application. Installing a single MySQL server is easy, but once you have done it, the fun starts to fade after a dozen or so times doing it. Especially with Group Replication, where you need a minimal of 3 servers. The first two screens are not new; the 3rd is, and it is not documented. Whether that is a documetation bug is open for discussion. If you are using Go, the new default authentication of MySQL 8.0 does not work yet. You need the “legacy” plugin which can be set globally in the configuration or, more preferably, when creating the database user. The following is inspired by the MySQL Documentation under A Quick Guide to Using the MySQL APT Repository and Adding and Configuring the MySQL APT Repository Manually. The above commands can be easily scripted, and no interaction is needed. At the end of the post you have the full playbook in which we do it all using Ansible. Interaction is required when you install the MySQL server. and new: choose the authentication method. This last step is not documemented (at the time of writing) in the MySQL Documentation. Possible reason, and also a good reason, is that it is good for new installations to use the newer, more secure method. The latter is preferred, but it can be tedious. sudo debconf-set-selections <<< "mysql-community-server mysql-server/default-auth-override select Use Legacy Authentication Method (Retain MySQL 5.x Compatibility)"
a single space (or tab) around the word select. "mysql-community-server mysql-server/default-auth-override select Use Legacy Authentication Method (Retain MySQL 5.x Compatibility)"